Today, I’m taking my parents’ advice and going back to college – but not to study. I have a 5-minute interview booked with Nick – a student living on campus – and I’m keen to put his knowledge to the test. His dorm lay on the outskirts of Texas, the Lone Star State, and was surrounded by a group of gormless students, who were swarming like flies in front of me. I motioned them away with my hands, hissing like a trapped raccoon. After pushing through the crowd, batting someone’s sandwich to the floor, I stepped carefully inside his expansive chamber. The room was rather tidy, and the rats weren’t as big as I imagined. There was a jukebox beside me, flashing the colors of the rainbow, and a buffalo head mounted on the wall. Yesterday’s lunch, I thought. Nick himself was sat in the corner, wearing a cowboy hat and a sheriff’s badge, and I certainly didn’t question his authority. He tipped his hat and I began the interview. 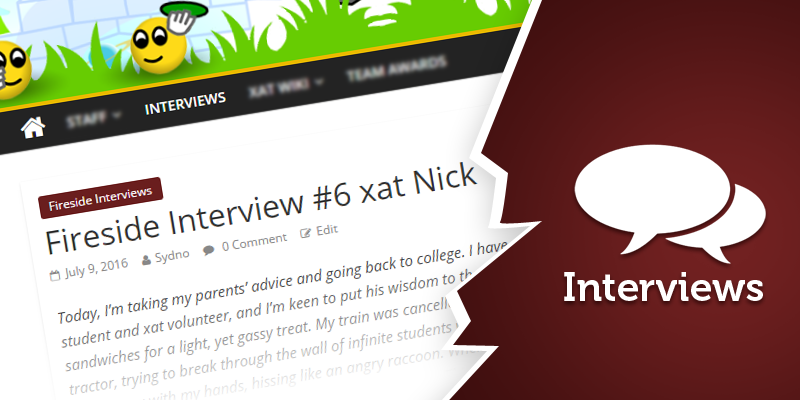 Hello xat Nick, thank you for agreeing to be interviewed. I also apologize to all the readers as I might take time to publish this interview. I’m first going to ask you a few questions about your private life. So, what’s your real name, how old are you, where are you living and what are you studying? My name is Nick, I’m 19. I’m studying Animal Science. I go to school in Oklahoma for most of the year, then come back home to Texas for breaks. I would say that I’m dedicated, realistic, and sociable. I began my xat experience in 2011. Honestly, if I can remember correctly it was after meeting someone on Xbox while I was playing Call of Duty. I’m not sure how the topic of it came up, but he would always make us lose our games because he was on a site called xat. So, I decided to check it out. It was xat_test that he was on during Jasmine’s main. When I first came to xat, I was very confused. I was confused at the idea that people would just come to an online chatbox with a bunch of strangers, make their name look like a rainbow and sit and talk. It was something I never thought would be fun or thought of to do. Man was I wrong, huh? 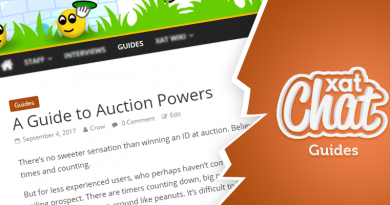 I was amazed at the fact that normal users were able to do things like answer tickets, and get test powers for their contributions to the site. I remember asking Spell after I got mod at xat_test if that meant I was a Volunteer. Lmao. xat has definitely changed, but I think it can be argued for the better. I still enjoy my time here, and I can thank the users for that. Interacting and getting to know new and different people is something I enjoy doing. I enjoy xat’s community. I can definitely say it’s a bit different from that of a few years ago, but that is just how things work. I still have a lot of people I’m glad I get to call my friends, and am happy that I get the opportunity to be able to come on here and still enjoy that. Who do you trust a lot on xat? I definitely trust people like Brandon, Verite, Stah, Karl, and Muffins. They’re all down to earth individuals, who aren’t afraid to say what’s on their mind. They’re people I can talk to when I need help or advice, and they’re extremely knowledgeable. Most of them haven’t changed throughout their time on xat, and that’s something I respect. My best year was probably 2013-14. It was a time when literally everybody was on and was at the point where I was getting settled with my new position. Everything sort of just clicked and came together. Unfortunately it was also the year I left due to personal reasons that most people know about. I won’t go too much in to detail there. It’s a year I would love to go back to, but we all know that can’t happen. Let’s drop it to things more funny and let me ask you the things you like or liked on xat. My favorite power is Nick. There is something about the name that just…. it just reaches out to me. My favorite chat is Help. I know that’s pretty cliche, but I’ve been through pretty much everything there. A lot of my close friends tend to reside there, and it’s a place I enjoy being. What it your favourite form of support? I’ve always been a fan of forums. I just wish it was a bit more active. I enjoy the new one. It’s definitely more clean and organized, and also always updating which is nice. I think this forum gives users more options to interact with community and rewards users with abilities and features such as usergroups, changing your name, etc. Do you have an interesting/funny fact to tell on xat? Fun fact: Rida has a crush on me, but won’t openly admit it to anybody. My role model would probably have to had been either Adam or Spell. They both taught me pretty much everything I knew and were the catalysts to many of the things I have now. Although they’re both gone now, their continuous help and support is something I will always be grateful for. What is your best memory on xat? My best memory would definitely have to be getting Volunteer for the first time in 2013. I remember exactly where I was. I was sitting in my high school chemistry class and was pretty bored so I got on the forums from my phone. My notifications were just bombarded with congratulatory messages and I had no idea what was going on until I saw my profile with “Volunteer” as the user-title. Now, let’s come back to serious things, especially on what you do and have done on xat. What is your main role on xat? Well, my main role is of course to answer tickets and provide xat’s users with quality support. I enjoy spending my time on Official Chats and hope to continue being a liaison between the community and xat staff along with my fellow Volunteers. I hope to change the stereotype that Volunteers are not interactive with the community, because I know how much more effective we can be if we come together. Did becoming one change your chatting experience? Of course. I think every Volunteer or anyone who has been one in the past can agree with me in that it definitely changes a few things. I don’t have as much time as I would like to just chat and interact with users. I did make a promise to myself though if that I did end up getting Volunteer one day, that who I am truly on the inside will not change. I’ve noticed this with a lot of people who end up being put in a position of power, and I can’t stand it. If you had one user to thank about your nomination, who would it be? Spell. He is the one who recommended and pushed for me to be added as a Volunteer. How about when you were main at xat_test? I had a great month at xat_test. It was one of the first times I had ever been acknowledged and been rewarded with something on xat. It was really something special. I believe I got it in December of 2012. Though it was an interesting month, I wouldn’t trade it for anything. How did you discover you were the Main Owner for the month? It wasn’t as eventful as others. I believe Jesse had informed me that he recommended me a few days before hand. Come a few days later, I was given the reglink by Jesse. What do you think about xat_test now? Although I have nothing against Maverick or the staff at xat_test, I wish it would revert back to what it used to be. I remember it always used to be such an exciting day around the 22nd of the Month or something like that. Everyone would just sit and wait to see who would pop up as main. I think it’s a great chance to get regular users more involved and a chance to congratulate them for their hard work. Do you have any special message to end the interview?